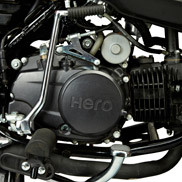 Engine oil level - Hero MotoCorp Ltd.
Engine Oil : Use only Hero Genuine Engine Oil. Grade : SAE 10W 30 SJ Grade (JASO MA). 1. Tide Water Oil Co. (India) Ltd.
2. Savita Oil Technologies Limited. 3. Bharat Petroleum Corporation Limited. 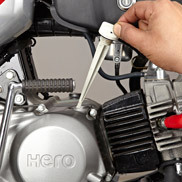 Check engine oil level each day before operating the motorcycle. The oil level dipstick is on the right crankcase cover for measuring oil level. Oil level must be maintained between the upper and lower level marks on the oil level dipstick. Do top up if oil level reaches towards the lower level mark or every 3000 kms, whichever is earlier. Start the engine & let it idle for 3-5 minutes. Stop the engine & park the motorcycle on its main stand on level ground. Remove the oil level dipstick and wipe it clean. 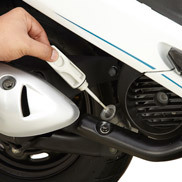 Reinsert the oil level dipstick without screwing it in and check the oil level. If required, add the specified oil up to the upper level mark. Do not overfill. Reinstall the oil level dipstick and check for oil leaks. 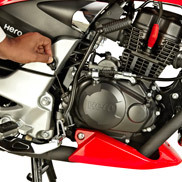 Check engine oil level in the oil level window each day before operating the motorcycle. Oil level should be between upper and lower level marks. After 2-3 minutes, check the oil level in the oil level window. It must be between upper and lower level marks. Add the specified oil by removing the oil filler cap and filling till the upper level mark. Do not overfill. Reinstall oil filler cap & check for oil leaks.